2015 Update: I've been slowly going back to retry some of the older Ben & Jerry's flavors that made it through the transition to Non-GMO and for whatever reason, I grabbed this one so quickly that I forgot that it has the new toffee in it. Yeah, that "new toffee". The one that was supposedly fixed but is still way too potent and inspires people to constantly comment about how frustrated they are. Yeah, it really takes things down a notch. Sure you can avoid the big toffee chunks, but sometimes the small pieces kind of melt and ooze their potent-ness everywhere. Oh well. Original review after the break. [Original 2009 Review] Oh Ben & Jerry ...why must you torment me? Sure, everything but the... came out in 2000, but it wasn't until this week that I finally tried it ...and I am so confused. There are bites you want to love ....and then bites you just don't understand ...why? why why why why why? Ok, let's dig in and find out what I'm talking about. 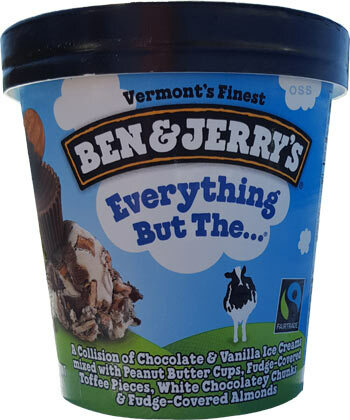 Ben & Jerry's everything but the... is "a collision of chocolate & vanilla ice creams mixed with Heath bar chunks, white chocolate chunks, peanut butter cups & chocolate covered almonds". Sounds crazy doesn't it? I mean what else could you add in besides maybe pretzels or cone pieces? Ofcourse, then you'd have zero room left for ice cream. You may be looking at the above picture and think "hey! where are all the pieces??" There, does that help? Uh oh...I think I'm getting hungry again ...ok, anyway, check it out! Green arrow is a chocolate covered almond ...I think we'll call him Ollie. 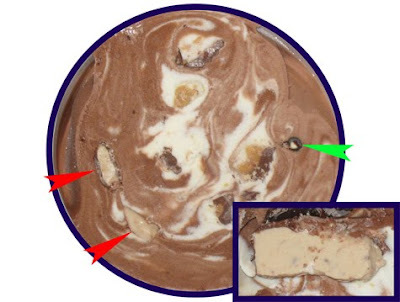 The red arrows point to multiple heath bar chunks. I hope you like Heath because the chunks can get rather large (the image in the corner is the same scale as the rest of the container, that particular piece was like an inch and a half big). For whatever reason, the Heath bar chunks that are missing their chocolate coating are melting very quickly for some reason (the bottom red arrow). 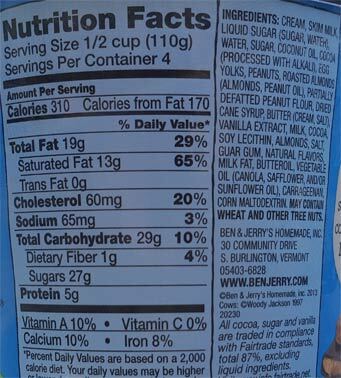 The remaining chunks you see are peanut butter cups. The cups are about the same size as Reese mini cups and often you will find yourself digging into an entire half cup chunk. I didn't manage to snag a white chocolate chunk image yet, but they too are huge and probably a good 1/8" thick. But wait, I said I was confused, didn't I? I did indeed my fellow ice cream lovers. The problem is, all these great tastes don't come together that well. First, these aren't Reese's brand peanut butter cups, they are some all natural alternative, and unfortunately, they are kind of bland. They aren't awful, but they have a thicker chocolate shell and are much more mild than what I would have hoped for. Now, I could probably forgive this ...but ...we have a second problem. I like Heath bars (I adore Heath Bar Blizzards), but these giant heath bar chunks they use, well, they overpower everything. Sure the pb cups are mild, but after a bite of heath bar, you can barely even taste them. And the nice combo of quality Ben & Jerry's chocolate and vanilla ice cream? also nullified by the Heath bar. Wait, did I just manage to use the word nullify in a review? So, there is my dilemma: We have one of the funnest ice cream ever, yet it can't execute in the taste department, and that, well, it is really unfortunate. Now I've already second scooped this last night (when I finally ran into the huge white chocolate chunks), and I have gotten somewhat use to the overall mix (in part by being wary of the heath bar chunks), but this really has been a lesson ...in the fact I use too many periods and parenthesis, so I apologize for that. No, seriously, it's a lesson than you can have too much of a good thing. Bummer. Thank you for reviewing this flavor. 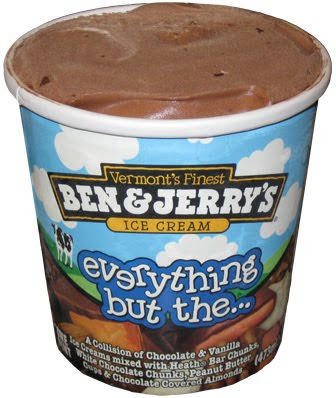 I just bought a pint of Everything but the, and i have to say that it is a huge disappointment. 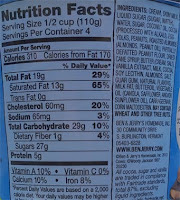 There are plenty of white chocolate chunks, but hardly any PB cups or heath chunks to speak of. As I dig through the ice cream, I'm thinking,"it's everything BUT the mix-ins." This is my favorite ice cream and sometimes they can have bad pints and it is really disappointing, but usually, they are FILLED with the mix-ins. If not, always go to your nearest Marble Slab and have them make a pint of chocolate with vanilla with all these mix-ins, it tastes exactly the same, if not better. This review is wrong. The ice cream is simply delicious. I picked up a pint of this ice cream the other day. I rarely eat ice cream, so when I treat myself to it, I tend to go all out. I love heath bar and peanut butter cups and I figured this blend of two different ice creams and two of my favorite candies would be exactly what I was hoping for: sugary sweet flavor overload. And it was . . . at first. Everything was great until I dug out my first peanut butter cup and bit into it. The shape and consistency of the peanut butter cup was familiar, but after I chewed it up and swallowed it down, there was a flavor that was decidedly UN-familiar. A weird, sort of burnt, sort of stale peanut taste. The aftertaste stayed in my mouth until a nugget of heath bar or a chocolate covered almond washed it away. Every time I dug one of these peanut butter cups out of the mixture, I had the same experience. Not the taste of peanut butter, but rather the flavor of very stale, unsalted peanuts that came across as bitter (at least in comparison to the rest of the mix) or burnt tasting. Needless to say, I was very disappointed by this. If they had used a traditional Reeses cup, I think the mix would be outstanding. they are a very flat peanut butter cup. I know a lot of people dig them, but I'm a Reese's fan and it sounds like you are too. This is my all time favorite ice cream flavor. Oddly enough, I've never tried this flavor. Thanks for reviewing! I just tried this flavor as I have been eating Americone Dream religiously all summer & wanted a change. I actually didn't mind the pb cups as the other reviewers did, BUT....there is a totally odd disgusting metallic BLOOD-LIKE flavor to the heath candy...I feel like the dude who processed this batch musta sliced his finger off and let it gush inside, it is that gross. Otherwise, love the vanilla chunkage but too scarce.